A beach, a lagoon and a marina all boast the Blue Flag; the Riviera Nayarit leads the way in Mexico with 12 Certified Clean Beaches; Nuevo Vallarta is the first certified Clean Tourism Destination in Mexico and is poised to receive certification as an EarthCheck Community. The Riviera Nayarit is synonymous with nature, which is why it has been working hard to preserve these treasures, receiving environmental accolades along the way that strongly validate its commitment to ecotourism. Since 2015 the Marina Riviera Nayarit in La Cruz de Huanacaxtle has been the first Marina in Mexico to obtain the International Blue Flag. 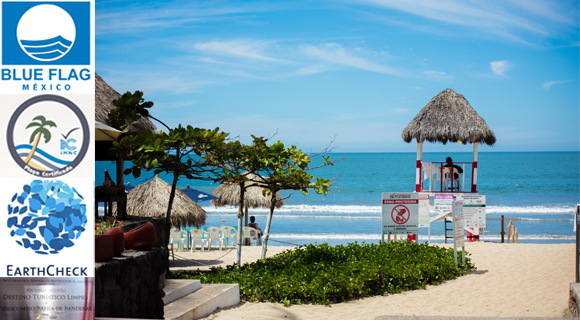 The beach at Nuevo Vallarta Norte also boasts this accolade and has had it for the past several years. The Riviera Nayarit’s sister brand, Lagunas Encantadas, achieved this certification in 2016 when it added a third Blue Flag for the state with the Santa María del Oro lagoon. The Riviera Nayarit is the national leader in Certified Clean Beaches with 12 beaches that comply with Regulation NMX-AA-120-SCFI-2006: Nuevo Vallarta Sur, Nuevo Vallarta Norte, Nuevo Vallarta II, Bucerías, Los Muertos, Playa Palladium, Costa Capomo, Rincón de Guayabitos, Coral Island Beach, Chacala, Platanitos and El Borrego. The Ministry of Environment and Natural Resources (SEMARNAT by its acronym in Spanish) awarded Nayarit the recognition of “Clean Tourism Destination” for the Fraccionamiento Náutico Turístico de Nuevo Vallarta neighborhood, making it the first in Mexico to receive this environmental certification. Nuevo Vallarta has been working hard since back in December, 2014 to become the second tourism destination in Mexico to receive an EarthCheck Community certification. The process was put in motion by the Riviera Nayarit CVB and is set to conclude this year; the destination is expected to receive a Silver EarthCheck certificate.